True the KVIC should not have put Narendra Modi’s picture there, as personality cult is undesirable in a democracy and Modi was not a habitual a Charka spinner. But is that a bigger issue than a family assuming Gandhi’s surname and behaving as if it owned the Mahatma and misleading the ignorant masses and just to perpetrate dynasty rule? All principles Gandhi stood for have been thrown out of the window by the Congress and no one objected. Congress felt it has a patent on the Mahatma. Th0ugh it ‘killed’ him a thousand times, it harps on an ex-RSS man assassinating him. The court verdict that RSS was not responsible for the act has been ignored. And yet Modi’s picture on the calendar has been made a bigger issue than the poverty of millions, the prevalence of alcohol consumption and untouchability that Gandhi had fought against, the lack of cleanliness which Gandhi equated with godliness and thousand other problems.Congress rule has been a saga of scandals, rampant corruption, acquisition of wealth by unscrupulous means and nepotism. If Modi’s picture on the calendar is wrong, much worse is the attempt of the dynasty to assume his name. Scores of posts on the Internet and You Tube say Feroze was a Muslim, but they may be untrue. Officially Feroze Gandhi was a Parsi. When Parsis fled persecution in Iran and landed at Bharuch in Gujarat, India, they adopted the language and surnames prevalent there or took on names based on professions – like Engineer or Daruwala. But both the Gujarati language and the Gujarati names Parsis took were distinct from the local ones so that their separate identity was not lost. A Parsi taking Gandhi as name spelt it as Ghandy (Sir Jahangir Ghandy of Tata Steel is an example) So there is Mody (Piloo Mody best known of them) district from Modi; Patell who was not a Patel and so on. But if Feroze Ghandy’s wife became Indira Gandhi, the motive was obvious. It has been made out that Modi was replacing Mahatma Gandhi and that B JP ‘parivar’ (family) was trying to downplay the role of Gandhi who, Congress claims, had single-handedly won freedom for the country from British rule. The struggle for independence was not invented or started by the Mahatma. There were thinkers like Gokhale, Tilak, Lajpat Rai and many others and Gandhi only joined it later, but gave it the impetus and direction that led to freedom. Congress, which “ruled in his name” for decades, thinks it would be sacrilegious to say that the freedom struggle was a collective effort by all, including Subhash Chandra Bose and his Indian National Army, though the Gandhian movement of civil disobedience, nonviolence and Satyagraha played a major role. Congress disregarded Gandhi’s advice to wind up the organisation. It cashed in on the role of pre-independence Congress, which was a movement of all who worked for freedom, including socialists, Hindu nationalists and all others who were a part of the struggle and tried to equate it with the political party Indian National Congress striving to grab and retain power.The mostly illiterate and backward people could not differentiate between the two. For them to be patriotic was to back Congress. My father and his earlier brother were spinning Khadi yarn, getting it woven and wearing only Khadi clothes – during British rule. A college principal, a Britisher, liked my father so much that he wanted to design a ‘proper’ graduation gown he could get stitched, as those then available were wrongly designed. Dad agreed on one condition – it must be made of Khadi fabric. The principal liked his stand so much that he put a condition of his own: He (the principal) would bear the cost! Almost all members of my family used only that gown during convocations. And then, seeing the way Congress treated Gandhi the day after his death, my father and uncle stopped wearing Khadi. The Congress continued its lip service to Khadi, prohibition and eradication of untouchability. Congressmen themselves stopped wearing Khadi and many of them drank. Untouchability and oppression of dalits thrived under Congress rule. 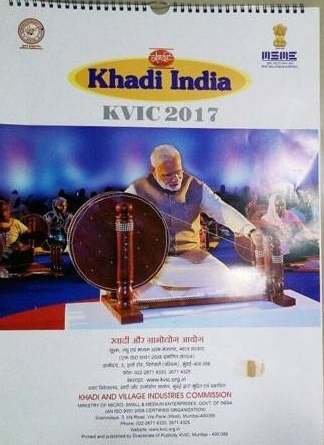 Dr Sambit Patra, one of the most articulate spokesmen of the ruling party, pointed out that Khadi sale through KVIC was 2 to 7 per cent all these years, but due to Narendra Modi’s efforts the sales rose to 34 percent. . The immaculately dressed Modi is perhaps a better brand ambassador of Khadi than “the half-naked fakir parleying with the representatives of kings,” as Churchill put it. Obviously Congress is interested not in promoting Khadi but in demoting Modi. Previous Previous post: Are You Retired But Not Tired?